ALL YOUR FLIGHTS, ACCOMMODATION AND ENTRY FEES WILL BE PAID! Simply play in our weekly leagues and tournaments throughout the year and your points will be accumulated. At the end of the year the top players will play-off to win one of three spots to go overseas! THE MORE GAMES YOU PLAY, THE MORE POINTS YOU’LL EARN! 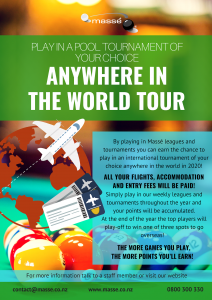 By playing in Massé leagues at your local club branch you can earn the chance to play in an international tournament of your choice through accumulating points. 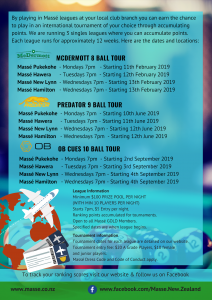 We are running 3 singles leagues where you can accumulate points. Each league runs for approximately 12 weeks. 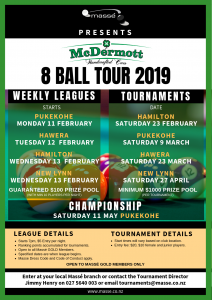 We’ll be kicking things off with the McDermott 8 Ball Tour!